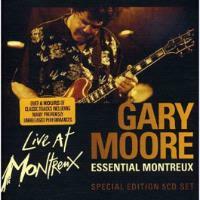 A box set made up of five CD’s from each of Gary Moore’s appearances at the Montreux Jazz Festival, this is both a massive and powerful set. Not all the performances are stellar, but none are bad – and when you’ve got this much material, that says a lot. For the most part it sticks pretty close to the blues, but the 1997 show is much less blues and more modern rock in texture. All in all, this is an exceptional set and well worth the money. A killer blues jam, this fires in hard and heavy, but shifts more jazzy as a horn section enters. The guitar solo is seriously incendiary, though. It’s a real screamer and a great way to start things off in style. A slower, moodier blues number, this is a lot mellower than the opener. It’s no less powerful, though. It just derives its power from the emotion and passion in the tune. This is very much rooted in old school blues. It’s another screamer, and fits somewhere between the first two. Comparisons to Buddy Guy would be appropriate. More modern in its style, this is another smoking blues jam. The guitar soloing on this is especially noteworthy. Moore pays tribute to several Texas guitar men in this musical journey. At just about thirteen minutes in length, this is a massive and very powerful excursion. Feeling almost like an extension of the previous number, this is perhaps less pure blues and more bluesy rock and roll. It’s another strong piece in a show that just doesn’t let up. Albert Collins joins on this old school styled blues screamer. The intensity just doesn’t let up. Collins is still on board here as they tackle a mellower, evocative, slow blues jam. Still old school blues, and still with Collins on the stage, this is more of a hard rocking, energized jam than the one that preceded it. The instrumental section here is especially potent. Harder rocking, and more modern in texture, this is another great tune. A honky tonk old school blues number, this has some cool piano in the arrangement. Albert Collins returns to the stage and they fire out on this mid-tempo rocker. The intro onto this makes me think of a guitar version of “Funeral For a Friend” by Elton John. It doesn’t stop there, though. This instrumental works through a number of sections and has as much in common with the rock/fusion of Steve Vai and Joe Satriani as it does with true blues. It’s a great way to end a killer set. Here we get a full on jazz blues shuffle. It’s a good tune, but not as strong an opener as we got in the 1990 showing. This is harder rocking and reminds me a bit of Led Zeppelin. It’s still not up to the powerhouse performance from 1990, but it’s stronger than the opener. Harder edged and more rocking, this is one is more along the quality level of the previous CD’s performances. It’s definitely the strongest track so far from this show and it’s got some seriously fiery guitar soloing. While this is slower and based on a more stripped down arrangement, it’s no less powerful. It reminds me of a more bluesy Santana. It’s one of the highlights of this disc of the set. This slow blues jam is strong, but not really all that exceptional. More energized, the horn section adds a great jazz element to this and the honky tonk piano reinforces it. I can’t help but thinking of B. B. King when I hear this powerhouse number. This instrumental is a strong one and definitely one of the highlights of this particular performance. A slower blues grind, there are hints of both country and gospel music on this cut. More of a powerhouse old school blues jam, this is a real screamer and another highlight of the show. Another hard rocking jam, this is also proof that the intensity of the show has been ramped up for certain. This is another scorcher. No letting up by this point, it’s another screaming blues number. The horns bring in the more retro blues stylings and this song just wails. Starting with just voice and keyboards, this powers out into another retro blues jam. It’s good – and definitely above the first few tracks from this show – but perhaps not as potent as the cuts that directly preceded it. This one includes a drop back for audience sing along. Here’s a killer traditional blues number that’s just plain power-packed. It’s definitely one of the strongest pieces on this particular disc of the set. Not as incendiary, this is a tasty blues standard nonetheless. It’s more about the mood and the flavor than pyrotechnics here. There’s sort of an electronic percussion texture to the opening here and as the sound proper begins it’s in a stripped down, alternative rock texture. This powers out as an alternative rock jam. There are some Beatles-like hooks and it reminds me at times of King’s X. That electronic percussion returns and it’s the one element that really sticks in my craw. There is some killer arena rock guitar soloing on this. A psychedelia meets modern hard rock approach is the order of the day here and this track is another that reminds me of King’s X. That said, I’d consider it stronger than the opener. There are some definite proggy elements to this. It segues straight into the next number. This comes out of the last piece and feels almost metal in its approach. That said, it’s got more blues in it than anything thus far in this performance. It’s based on a standard blues pattern, but played with a more metallic fervor. The arrangement is stripped down through much of the piece, but there’s definitely metal crunch on board. Slower, with more a soulful groove, this is a killer tune. It gains its power from the charm and just plain cool, not from any real pyrotechnics. Think of Isaac Hayes with a hard rock element. This seems to me rather like modern Rush in some ways. There’s also more of a bluesy element to it, but it’s a cool rock groove. This is mellower than some of Moore’s other music. It’s a good track, but perhaps not a standout. A repeat from the previous CD, this killer blues groove is a great rocker and one of the highlights of this particular disc of the set. The most purely bluesy cut so far in this performance, this is a killer grind and one of the highlights of the set. There’s pretty much no blues in this. It’s a mellower song that’s pretty much pure modern rock with some definite progressive bits in it. This is moody and pretty and it wouldn’t be a big stretch to imagine a modern prog act doing a song like this. This is a hard rocker that’s rather in keeping with 1980’s styled heavy metal. It’s another good tune, but not really exceptional. A Celtic based rocker, this is hard edged and quite cool and reminds me a lot of Thin Lizzy. This becomes a real screamer and includes some serious Irish reels. This is a slow moving, bluesy rocker. It’s got some seriously noisy guitar work in an interlude mid-track. Overall this is a tasty cut that’s quite cool. There are some other instrumental excursions laced into this, too. A smoking twelve bar blues, this is a great way to start the performance off in style. It’s got some audience participation and some tasty blues licks. Retro styled, this is a killer old school blues number. It’s a great groove. More stripped down and subdued, this is yet another killer traditional blues piece. It’s probably more faithful to the old style than anything we’ve heard to this point. The guitar solo on this is particularly tasty. A blues standard, this is delivered with taste and passion. Here’s more killer blues. At times this seems to have just a bit of a southern rock element to it, ala The Allman Brothers. Another killer blues groove, the guitar really dominates and accentuates this potent beast. This is a blues classic and we get a killer performance here. It’s a highlight of this CD. Another well-known blues standard, this is a real screamer as delivered here. This half of the performance is really on fire. And the classics keep coming. I really like this performance a lot. Of course, I’ve always loved this tune – and that helps. That said, the extended stripped down jam mid-track (this monster is over eleven minutes in length) seems to stretch a bit too long. Yet another classic, this one is more traditional in delivery and performance and is quite strong. This has quite a tasty retro organ solo. I particularly like the section where the guitar and organ trade riffs. Here we get some Hendrix. The cut is delivered with a suitable amount of fire. It’s sort of a blues meets Hendrix approach. I wouldn’t say it stands as high as the original, but come on – it’s Hendrix – what do you expect? One of the few repeats in this set, I almost like this pretty and moody number better here. That is, except for the extended bit of feedback used as sort of a tension builder. That part really hurts the song as far as I’m concerned. The extended guitar solo section later gets a bit much, too. Don’t get me wrong, I’m not debating Moore’s talent as a guitarist. It’s just that after a while it gets a little tedious. A killer blues jam leads things off with style. This even more fiery than the last one, but every bit as bluesy. The intensity drops a bit for this subdued, but still smoking, blues track. With five CD’s of music from five different shows you’d expect some repeats. This is one. It’s a great song and this is a killer performance. Another repeat offender, this is a retro blues jam with a lot of emphasis on the organ. We’ve heard this one previously in the set, but it’s a winner here despite the repetition. It’s just plain classy blues. The melodic guitar lines are beautiful. This guitar blues standard is a real workout. It’s one of the strongest cuts on the whole set – and with this much material that says a lot. It’s also very traditional in nature and just plain cool. No molds are broken here, but this is a killer hard edged blues tune that definitely works out more into rock territory as it carries on. Moore and company again turn their attention to Jimi Hendrix. This time it works better than in the earlier performance. I won’t be trading in my Hendrix album for a copy of this, but it’s quite strong nonetheless. This is started with a down home blues sound, but fires out into something more akin with the rest of the set as they carry on. Basically the same instrumental that was called, “The Messiah Will Come Again” when it closed out disc 1 of the set, for my money this is the strongest piece on any of the five discs. I absolutely love this one. I can’t think of a better way to end it.